Anton Vanhoucke is from Delft, the Netherlands. He is an online strategist at Fabrique, a strategic design agency, developing new services and communication strategies. Anton has always wanted to be an inventor and combines his love of invention with LEGO bricks. 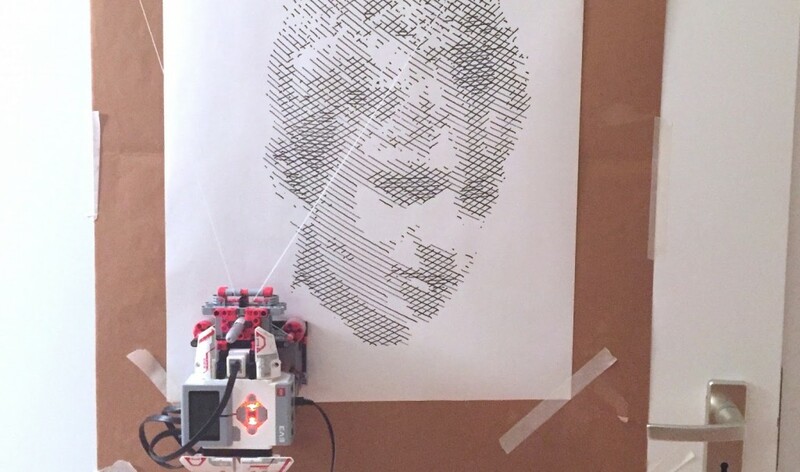 He is best known for his BB-8 as well as his vertical drawing robots. 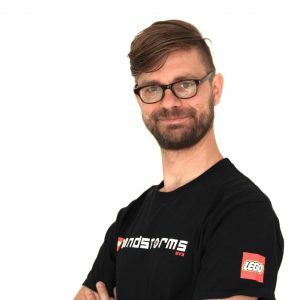 Anton is a MINDSTORMS Community Partner as well as a FIRST LEGO League coach. How did you get started building with LEGO bricks? I used to ask for LEGO every Christmas, as far back as I can remember. It just fascinated me the first time I saw it and I never stopped playing with it. My very first Technic set ever was the LEGO Technic 8841 Dune Buggy. It had a working steering wheel. I still remember the sore fingers from that time because studded technics bricks required more force than today’s studless bricks. After that, I remember a Polar Helicopter (8640) and a Plane (8855). I have always been fascinated by planes, and, today, I build lasercut and 3D printed RC planes as a hobby. I even add autopilots to them so they are in fact flying robots! As soon as I was old enough, I connected my LEGO Technic to my Mac. Using a serial port IO board, aluminum foil, wire and some old 4,5V technic motors I built drawing robots and robot arms. 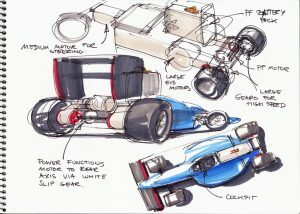 When the RCX was released, I was studying Industrial Design Engineering in Delft, The Netherlands. I didn’t have the money to buy an RCX back then. With my first wage as a packaging designer, I bought an NXT2.0. I went on to developing a windows phone app for proportional steering remote control for the cars and spiders I built with that set. Which project (or projects) are you the most proud of? Why? BB-8 and the drawing robots. BB-8 was an extreme building and programming challenge. It was really hard. That made the realisation extra sweet. It’s also very nice that he is life size, just like in the movie. My drawing robots (vertical plotters) were also quite hard to build. I’m proud of them because they are mesmerizing to watch, and there is no end to things you can draw. 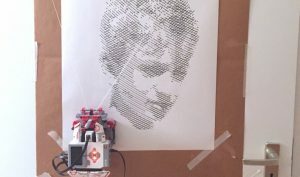 I’m also proud of the drawing robot because it runs a web server on the EV3 as a user interface. Where do you find inspiration for new projects? It varies. Sometimes it can be a certain brick, like the banana gear, that inspires me with new possibilities. Sometimes it’s something I’m doing, like cycling, sitting on a swing, or walking. I begin to wonder how a robot would do the same movement and try to build that. And sometimes it’s a toy I’d like to have – like a remote controlled dragon. Once inspired, I start building that. 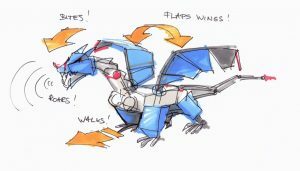 If you want to learn more about the making of Saphiro the Dragon, read about it in this NXTStep article. How many iterations do you typically go through when you create your projects? Eight to ten. You learn from iterations. It’s what makes LEGO fun. I found that the projects with the most iterations are the most amazing. When looking back on them, I can’t imagine how I ever arrived at those solutions. Iterations are even more fun with two. I like to build the same robot together with someone else, compare our solutions, and then go with the best. Do you document your creative process? If so, how and why? I try to take pictures and make videos at every iteration. They are fun to watch afterwards; all the mistakes I made that seem so obvious in retrospect. Sometimes it’s hard to remember to take pictures when I’m totally focused on the building. What role does failure have in your creative process? I fully expect failure the first eight times. I try to test build the most difficult parts of a new build first. 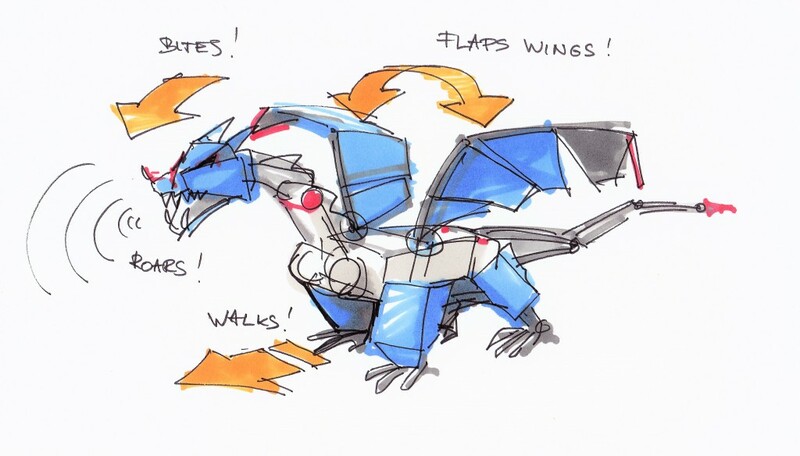 For instance, Saphiro the Dragon started as wings (separately) and legs. The first four wing systems failed. And when I put them together with the legs, the legs failed under the heavy load of the wings and I had to start over with them too. But it is not a terrible thing to have a rough build. When all the hard parts are done I start to add details. How do you evaluate your success? The reactions from my fellow MINDSTORMS Community Partners (MCP) are really nice. But just the joy of cracking a hard mechatronics problems is usually enough for me. For students who are ready to go beyond the basics, what project would you recommend to get them motivated, without overwhelming them? Try ev3dev. It opens a great lot of new possibilities. I wish I had time to make more tutorials. Which projects and/or builders have most inspired you? Isogawa inspires me a lot. His work is often pure poetry. Laurens Valk’s books helped me lot for making the step from studded to studless building. I also like a lot of Hassenplug’s projects. My favorite model is the EV3 elephant. It’s so beautiful! What’s your favourite building technique? The speed at which you can make iterations is incredible. Much faster than wood or metal or 3D printing or any other building material. This is what it means to fail fast. Build something, test, see the problem (fail), and to then do another iteration. What’s your favourite LEGO piece? The 5×7 frame is my favourite because it’s in the base of almost every robot. It is incredibly versatile because it’s rigid and it has holes in all directions. It allows one to build fast and sturdy. I wish the original EV3 set had more of them. How do you store all your pieces? I have enough pieces sorted in sorting boxes to build fast. But I don’t sort all of them. I try to find a balance. What’s something you’ve always wanted to build that you haven’t got around to yet? I want to make a hopping rabbit because I like quadrupeds and we have a rabbit here at home. Whenever I watch it, I wonder how its robot version would look. I haven’t seen one yet, that hops as I imagine it could. To see more of Anton’s work, visit his YouTube Channel or his website. I am a MINDSTORMS Community Partner (MCP). 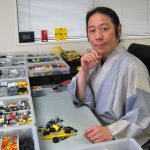 I have been involved with LEGO MINDSTORMS since 2010 thanks to Sanjay and Arvind Seshan (founders of EV3Lessons and FLLtutorials.com). 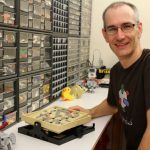 I help to promote robotics and computer science education using MINDSTORMS in schools and communities. I have also been a FIRST LEGO League coach, judge and referee for 7 years.